Drivers work hard and commit to tackling one of the economy’s most demanding and important jobs. They’re on the road for long periods of time, delivering goods safely, securely and on time. All this despite increasingly congested roads and demanding logistics schedules. Without drivers, economies would come to a halt but driving long distance is hard – it can be a tiring, stressful and lonely job. 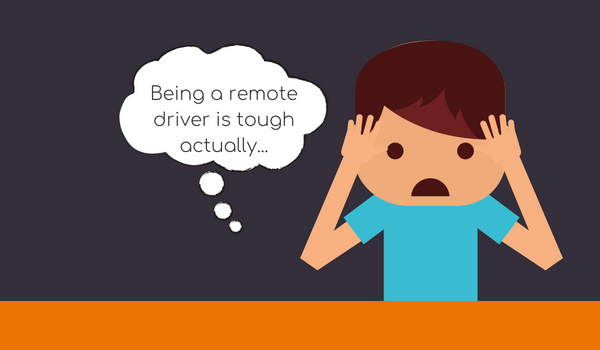 Drivers are the backbone to company running a successful fleet, so its an important to understand what the consequences can to remote drivers becoming disengaged. Driver Isolation: due to the remote nature of their job, driving anywhere and everywhere and detached from the office, they are remote workers. This can lead to them feeling a little withdrawn and disengaged from their job responsibilities, which will inevitably start to affect productivity, safety and an organisations public image. Driver’s appearing a little switched off: a disconnected driver can just appear switched off or not in tune with the company they work for, diminishing the attention they pay to their tasks and allowing bad habits creep into their daily working life. Looking out for the small issues and dealing with them early can go a long way in preventing the dreaded loss of a valuable employee and protecting an organisations good name allowing them to operate and trade in a positive way. Driver’s frame of mind at risk: A driver that has a disconnected frame of mind can unfortunately be more of a risk taker and will show other unsafe attitudes when out driving. This can place a driver and other road users at serious risk and can damage company reputation in terms of safety culture and can result in potential costs related to accidents or any vehicle damage. Driver morale & dissatisfaction: unfortunately remote workers do feel more job dissatisfaction than office based employees, it just comes with the nature of their job.The increased international driving in this sector results in longer periods away from home. This coupled with insufficient rest, high strain and low autonomy are seen as the most problematic employment issues concerning drivers. However, there are consequences with this in terms of driver retention and explains why one of the hottest topic in Fleet these days is driver retention as the industry is currently suffering from an acute shortage of commercial drivers or many drivers having ‘one foot out the door’. The shortage has resulted in skyrocketing driver turnover but this behaviour is not simply a retention issue: – knowledge loss, safety, productivity and employee relationships which are vital to the running of a healthy organisation are negatively affected restricting operational efficiencies. Driver wellbeing: Life as a driver is demanding and challenging, it puts strain on a driver’s wellbeing and health. The environment is stressful and often the problems of the road can be brought home and remove the happiness of the home. A driver’s life impacts more than a driver, it impacts his family and runs the risk of impacting others if involved in accidents. There’s no magic tool for making sure your relationships with remote employees are as strong as they can be. Making a good effort requires being equally conscious of them and understanding the challenges they face. It means trying to replicate the experience of having them physically present with you. The more actions you take to show that you consider them full members of your team, the more likely they are to feel and act that way.